Hopefully you have a few pound to play with after the first 3 days at Cheltenham 2018 as we head in final day and what a tough day it will be for punters. Usual advice from the PG is make sure you are betting what you can afford, set yourself a limit and do not go chasing your money. Remember to take advantage of our super Sean Graham matched bet offer and remember, it’s like doubling the odds of your bet. This week’s voucher is at the bottom of this page so make sure you take full use of this excellent offer – one bet per day per customer. If you fancy Might Bite in the Gold Cup then that 4/1 turns into 8/1 with the free bet offer. In this week’s Andersonstown News, South Belfast News and North Belfast News. There’s only one place to start for us this week, the Cheltenham Gold Cup and it’s as wide open renewal for many a year. Ante-Post punters were dealt a severe body shot last week when last year’s winner, Sizing John was ruled out of the race. Last year’s RSA winner, Might Bite (4/1) leads the Sean Graham betting and the King George winner will be the one they all have to beat. The predicted heavy going and trip will be a big ask for the Nicky Henderson-trained horse and if he kicks for home then it will be interesting to see what can stay with him, so he looks the one to beat for us come Friday afternoon. The money has come for the mud-loving Native River (4/1) who finished third last year behind Sizing John and the 2017 Welsh National winner will be on punters’ radars come Friday and might just dislodge Might Bite as favourite. Willie Mullins could run a few on Friday and we like Killultagh Vic (10/1) if he turns up. If he jumps round then he will be there at the finish. He would have won the Irish Gold Cup but for a fall at the last, so it will be interesting to see what horse Ruby picks come Friday with Hennessy winner Total Recall (16/1) another possible each-way bet for the Mullins yard. • The PG will be in McEnaneys on Friday watching all the action unfold. Special drinks promotions on offer along with Sean Graham matched bets and nibbles and a free Andersonstown News. The last day starts with the young pretenders in the Triumph Hurdle and usually if you work this race out then it could pay for the rest of your day. Punters have latched onto course and ground specialist, Apple’s Shakira at 9/4 and he is the one they all need to pass to win this one. Alan King knows how to win this race and he has Redicean (5/1). 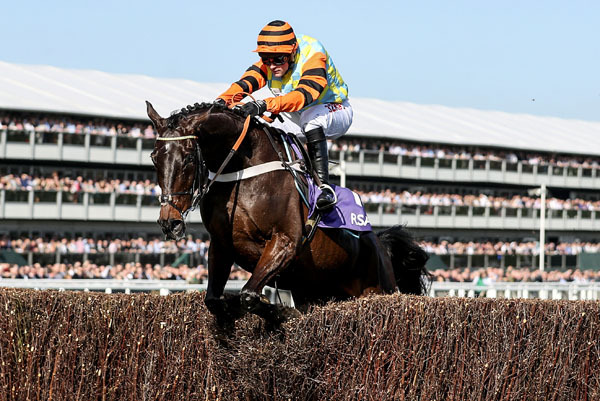 He has been impressive in all three wins this season and will be a live danger to the favourite if he handles the ground, while Willie Mullins could have a few in it and if sends Stormy Ireland (7/1) – take note. He nearly lapped the field when winning on his Irish debut at Fairyhouse – he could be anything. On to the Vincent O’Brien County Hurdle and another lottery of a race for punters to work out. We have a couple of each-way punts in the race. Chesterfield (16/1) won on the flat at Kempton last week and has a big festival race in him – hopefully it falls for him on Friday. Ben Pauling has A Hare Breath (14/1) in for this one and he has been lightly raced this season winning on his only start at Sandown – he loves the course and could run into a place. I really love this race and will love it even more if we can get a winner on the board. Santini (5/1) went into our notebooks for this race when he won at Cheltenham in January. He looks a stayer and a chaser in the making so this could be another winner for the Nicky Henderson yard. The Irish challenge could come from the Henry De Bromhead-trained, Chris’s Dream (8/1) who absolutely bolted up at Clonmel and will be the one to catch out in front on Friday. On to the Foxhunters and this race is another marathon for punters to work out as the hunter chasers battle it out. Foxrock (7/1) for us is the class act in the race and although age is not on his side, he certainly knows how to roll back the years and the Alan Fleming yard could strike in this one. Paul Nicholls won the race last year and he has Virak (12/1) in the race and he has won easily on both starts this season and is solid each-way bet. Still with us? On to the Martin Pipe Conditional Jockeys Hurdle. This is always a favourite race of ours after 2009 when we tipped up 25/1 shot Andytown to win the race and break the hearts of many a local bookie. We go big again this year and if the Nick Henderson-trained Deise Des Bieffes (10/1) runs then take note. He ran a cracker behind William Henry last time out. Willie Mullins has a few entered, but Carter McKay (20/1) is our each-way pick in the race and looks a great value for a place. If there’s any money left in the satchel then you can have a go at glory in the last race at Cheltenham 2018 and we are hoping there is a few pound there. If so, we will be betting Gino Trail (25/1) from the Kerry Lee stable each-way along with the Tom George’s Bun Doran who is on the reserve list at minute but might get in – another 25/1 shot. So it’s over and out for Cheltenham 2018. A long, tough week over. We hope it was worthwhile, folks. Win or lose, the PG will be relaxing in Macs on Friday night – time to unwind and reflect on the festival – hopefully a profitable one, best of luck.